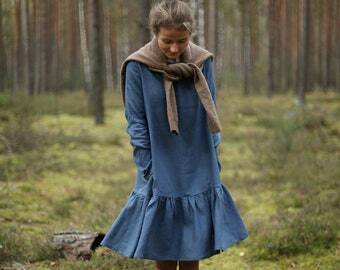 Blue Naive new autumn dress, handmade with love from the best fabrics that are stone washed, soft, OEKO-TEX certified. Length from the lower to the upper seam 105 cm / 42". If You prefer it shorter or longer, just let me know. 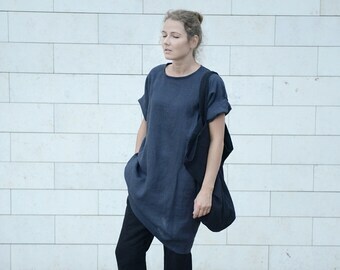 Wide and loose oversized minimal linen tunica/dress/shirt in Charcoal Grey. Women's dress. Washed linen dress. Handmade linen dress. Knee-length, long sleeve linen dress with pockets. 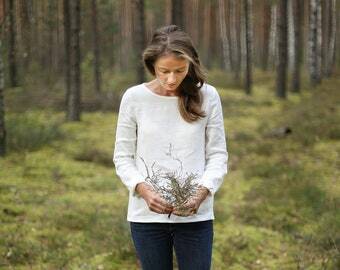 Stone washed linen clothing for women. Various colours available. 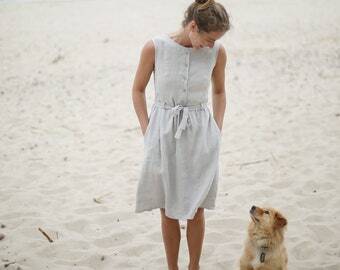 Washed casual linen dress with an elastic waist. Soft linen dress with side pockets. Natural color, perfect fit, originality! Little linen dress. Washed linen tunica. Women dress. Japanese Style Linen Dress | Classic Linen Dress | Dress With Side Pockets | Dress With Open Back | Tunica dress | Little black dress.